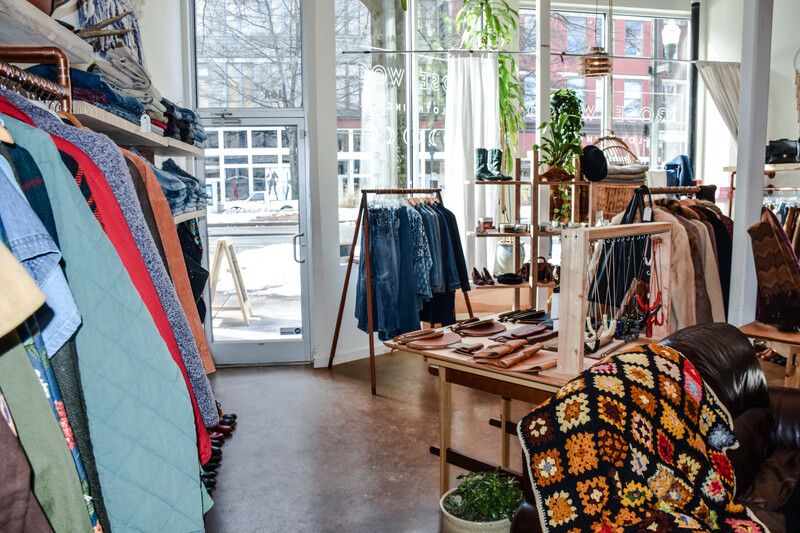 Stepping inside the eclectic boutique that is Rosewood is like sifting through the clothes of your best friend’s closet. 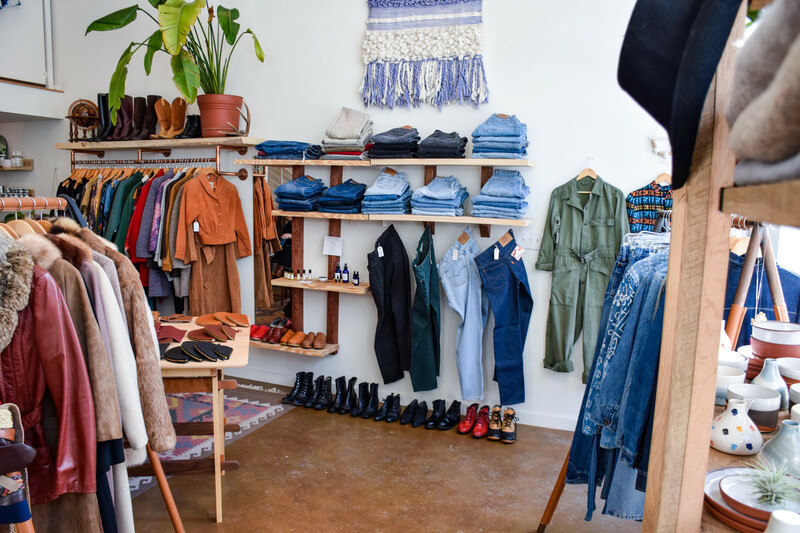 This sort of careful selection is exactly how owner Ashley Carruthers curates every garment that makes up her unique store. 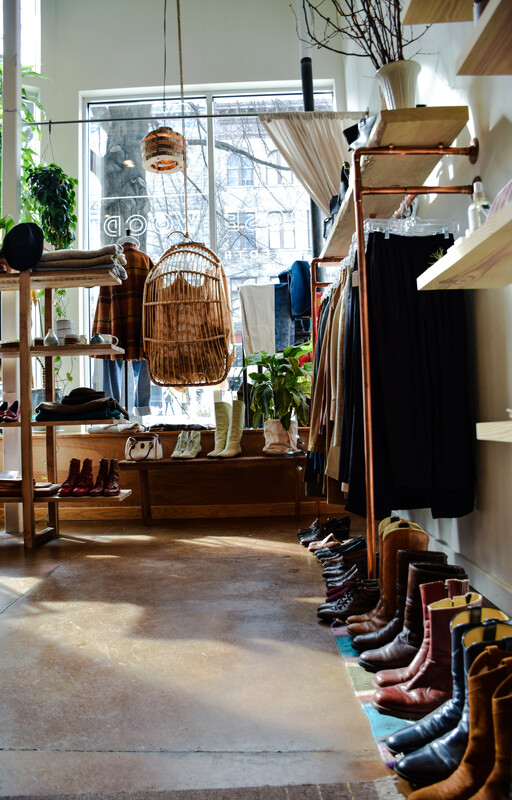 The influx of light shining through the bay windows of the front of the store illuminates every hand-picked piece that resides inside as if it were their home. Having a background in vintage finds, Carruthers knows about quality and the value of vintage and timeless style. 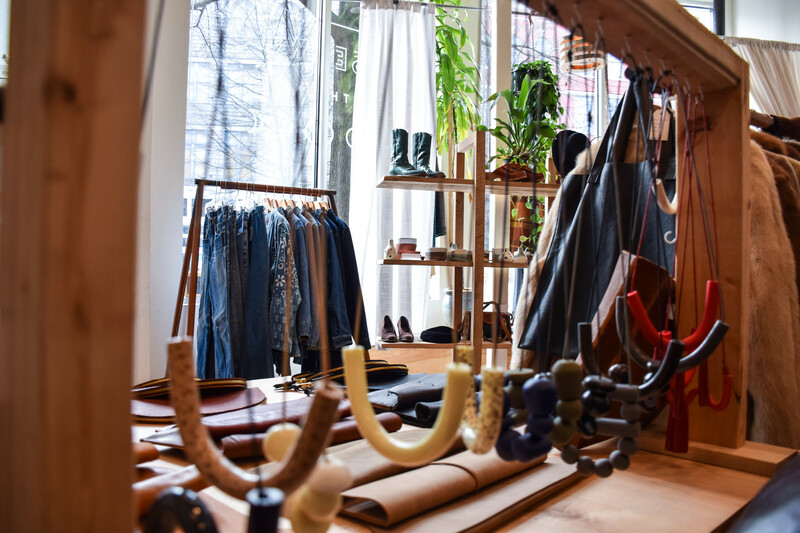 Selecting all the items in-store as if she were shopping for herself or loved ones, the small shop breathes an air of style that customers can easily trust in whenever they walk in. Intermixed with new designers, the boutique fuses old and new perfectly with effortless fashion. 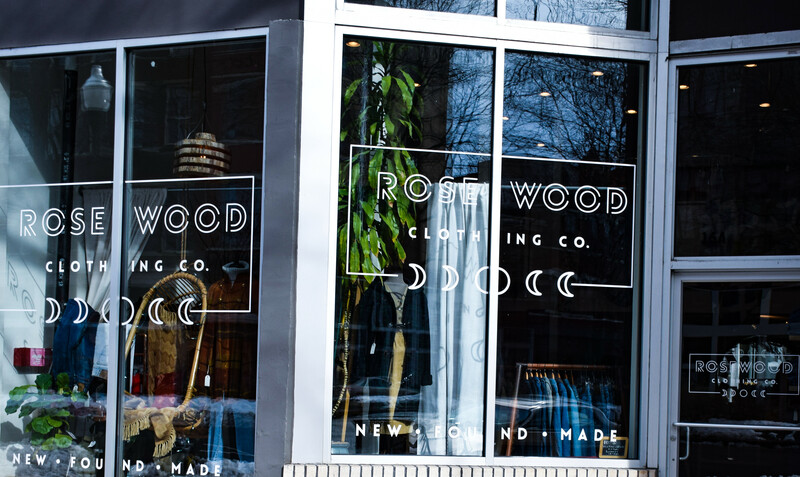 For those with an admiration for the simple and irreplaceable details that make up an outfit, Rosewood is the ideal place to find the additional pieces of your wardrobe that makes your own style unique. INK: How did the concept for Rosewood come to you? 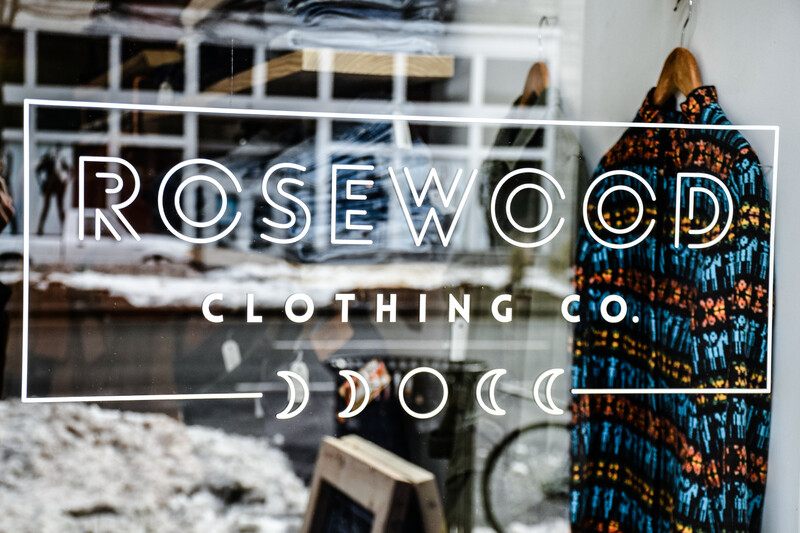 ROSEWOOD: The concept came from a previous partnership [with Addison St. Vintage] and me wanting to branch out on my own and work on my own aesthetic. I’ve always liked the idea of mixing new clothing with vintage. I call it “modern vintage.” It’s kind of an oxymoron [laughs]. 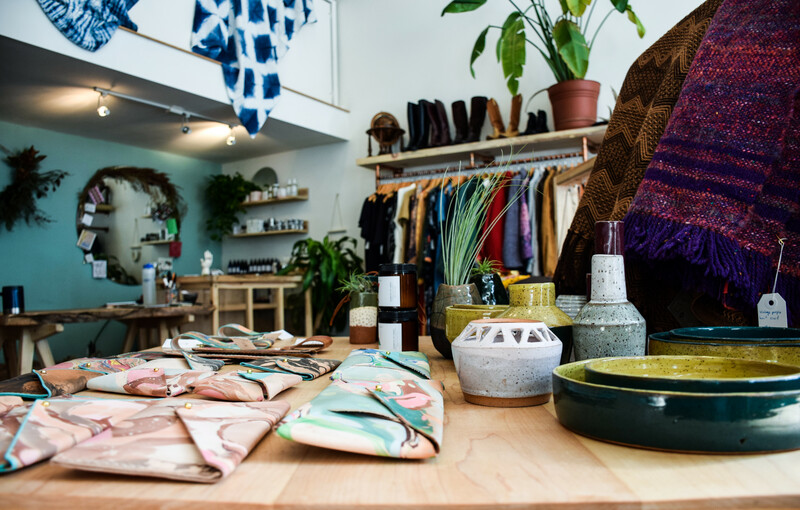 It’s re-sale and it’s got this green initiative, it makes me feel good to help people find things they’re looking for in that way of sustainable consumerism. I personally take a lot of time to go and curate the pieces that I believe fit with my kind of woman and my store. I focus on pieces from the 70s, 80s, and 90s. I: What would you say the overall style of Rosewood is? I: Who would you say your ideal client is? I: Can you tell me about any specific products you’re carrying in store? 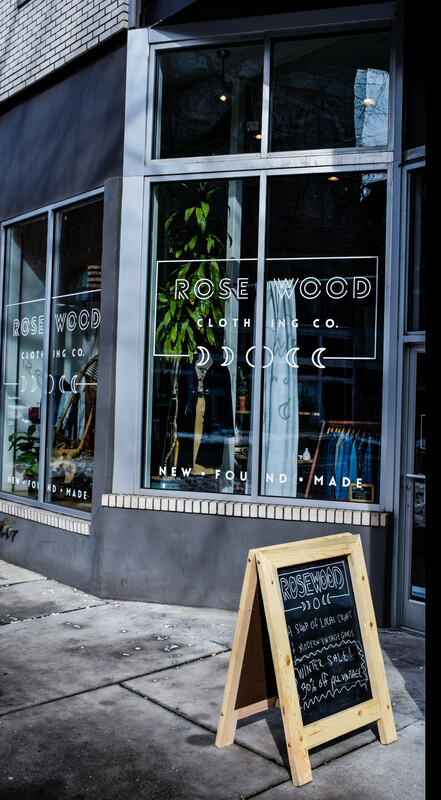 R: A basis of Rosewood is to sort of provide a platform for new and emerging artists and designers. We’re adding a lot of ceramics. We have some new lines like Alexandra Cummings from Portland. She does a lot of sets, like bowls, plates, and mugs. There are also two local lines: Object Arsenal and Alexis Courtney. Object Arsenal does plant and succulent holders. Alexis Courtney is also our photographer for the site. She’s my renaissance woman, I just love her. She killed it for Christmas with her mugs; the shape had a very cozy feel. So we’re getting more homey. I: How do you decide what you carry in the store? R: The things in this store are called ‘found’, ‘second-hand’, or ‘vintage.’ More than half the things in the store right now are things that I go out and find on my own. It still goes along with who we’re catering to; fabrics are a large focus. When I’m out doing that I usually look for certain types of fabrics such as leathers, linens or silks even. I do try to look for things that have good clean lines, versatile pieces that work with a range of different body types and various work places. Things with a waist are always great, or shirts that work both tucked in or left out depending on how you feel that day. I usually ask myself, ‘well how would I wear this?’ I try to keep it fresh. I ask how will this work with other pieces, but also how will it be made fun of. Like, if it can be related to a cartoon character, it’s a problem! We still cater to a lot of local lines. One specifically is Molly Virgina. She’s been focusing on her leather line lately and it’s cool that we were a platform for her. We really focus on apothecary and all natural skincare, down to the packaging. It’s something I’ve focused on since opening. I: What would you say influences your style? R: I look back into my own family a lot. My father’s side of the family is very All-American. I grew up with a lot of Ralph Lauren. For instance I love khaki, a good pair of chinos?– I just die. I also have an appreciation for sturdy denim like Levi’s. On the other hand, my mother is from South America; she’s from Peru and the colors there are amazing. They can be both bright and warm. The textiles there are also great. From her, I’m very drawn to those sorts of details. And because of the climate, my mom hates polyester. I’m kind of blending the two sides together and making it so that the woman for Rosewood is very American because of how inter-racially mixed we are as a culture and how that influences our style. I: Are there any lines in the store that you’re particularly excited about? R: In the spring, we’re getting two or three new lines that I’m really excited about. One is Save the Label. It’s a California company that makes dresses out of old blouses. It very much fits in with the “grab and go” aesthetic I was talking about. Another line is Court Shop. It was kind of hard finding them, but we’re mostly getting things from their ready to wear line. They started with denim jeans and now have branched out to denim dresses and shirts. There’s also Lyalia; they specialize in more beachy, summery pieces. I’m also excited to get swimwear back from Gattina! I:What would you say your own type of everyday look would be right now? R: If I could wear a t-shirt and jeans everyday I would. But to be fair it changes day to day. I like to wear things on the go. Like today, I’m wearing a black tent dress that I’ve also worn to cocktail parties and I’ve added a chunky sweater on top along with some riding boots. The dress also allows me to wear my gym clothes underneath, which is great because you don’t always have time to go home and change. I: Are there any plans for the future? R: We hope to do more growing and expanding as a lifestyle brand. Continuing to provide quality modern vintage and really focus on new, small scale design clothing and makers is the goal we are currently working on. I: Rosewood has been open for a little over a year now. Can you reflect on any specific moments that were impactful during that time? R: This past year has been awesome. Pretty much every moment has been an impactful learning experience that I am so grateful for. But I would say one overall, the support of the Richmond community has been so helpful and encouraging. I only hope I can provide as much to my community as I have received and then some. Glad to see Ink back in business.